Marcus Smart and Dante Exum who did not compete outside of the high school level this season, are widely considered the top-2 point guards available in the 2014 NBA Draft. In studying Smart's situational stats, he has a number of attributes that should help ease his transition to the next level offensively, but that his offensive game remains a work in progress. Looking at the bigger picture, Smart's 18.7 possessions per-game and 14.5% turnover rate both rank average-to-above average among what is a very productive group of uniquely skilled lead guards. His field goal percentage ranked below average overall at just 42%, but his overall .941 points per-possession was almost exactly average thanks to how frequently he got to the line. Drawing free throws on an absurd 31.3% of his transition possessions and 21.2% of his half court possessions, Smart ranks second in this group in overall free throw rate, behind only New Mexico's Kendall Williams, who had a far lower usage rate. Smart's role for Oklahoma State had him running the pick and roll much less frequently than his peers. Only 21.2% of his offensive possessions were used on the pick and roll and only 14.5% of the possessions derived from his own usage and his passes came from dishes out of the pick and roll, both of which rank well below average. The second least effective shooter in this group making 36% of his shots after dribbling off a ball screen, Smart's overall efficiency on the pick and roll actually ranks above average since he drew free throws on more than a quarter of his possessions in the two-man game, illustrating how big a part of his game his athleticism and physicality play in his success offensively at this stage in his career. Since he isn't running the pick and roll as frequently as his peers, Smart's profile has some other quirks. He saw more than 5% of his possessions in the post, which is as much as some small forwards. On top of that, he used 1.7 possessions per-game receiving the ball after using off-ball screens, which ranks among the highest marks in this group and the highest among prospects from teams that don't play at very slow paces. Smart is not your traditional off-screen scorer, as he prefers to try to burn the defense by getting to the rim when his defender is trailing, but he did knock down a number of jump shots working off the ball as well. Smart's somewhat unique offensive role is not surprising when you look at his shooting numbers. He made a below average 28.4% of his jump shots in the half court while finishing at a superb 57.3%-clip at the rim. Shooting 30.3% from the perimeter off the catch and 28.8% off the dribble, Smart has plenty of room to grow as a jump-shooter. Making 45.7% of his open spot-up jump shots, but attempting more and making just 20.4% of his contested spot-up jump shots, there's reason to believe he could improve his numbers with less ambitious shot selection and room for optimism that he'll continue to make strides in this area thanks to his tremendous work ethic. 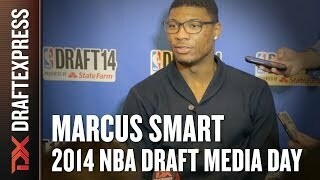 The leader of last summer's USA Basketball squad that won the U18 FIBA Americas Championship, Marcus Smart was available to join this U19 team after surprisingly electing to pass on entering the 2013 Draft, where he likely would have been a top-5 pick. Smart (re)established himself right off the bat as the leader of this team in the first few minutes of scrimmaging after the team was brought together, setting the tone for how this team is going to earn it's keep. He was diving on the floor for loose balls, driving to the rim with reckless abandon, and playing terrific defense on anyone he was matched up against. When your best player is the toughest, most competitive guy in the gym at all times, and is so willing and happy to sacrifice his body for the sake of the team, it makes it that much easier for the rest of the roster to fall in line. While Smart's jumper wasn't falling all that consistently during the scrimmages, he made up for it in other areas, setting screens, posting up inside, making the extra pass, grabbing offensive rebounds, chasing down blocks in transition, and drawing fouls at will. He is somewhat of a power forward in a point guard's body, seemingly enjoying taking contact around the paint with his ripped frame, playing with terrific aggressiveness and absolutely no ego. It goes without saying that it's an incredible luxury for the coaching staff and USA Basketball to have a player like Smart leading the team, and it should increase this team's chances of coming away with the gold exponentially. Previously unknown to us heading into the event, Marcus Smart had a strong week here in Chicago, and looks like a great get for Travis Ford at Oklahoma State. Undersized for a shooting guard at around 6-3, but with a chiseled frame, long arms and solid athleticism, Smart is surely big enough to be effective at the college level, but may give some scouts pause with his lack of size. Smart makes up for that with what appears to be great versatility on both ends of the floor, as well as a winning spirit and a real competitive streak. Offensively, Smart shows the ability to make shots both with his feet set and off the dribble, from the 3-point line as well as in the mid-range area. He's at his best using his superior strength to overpower opponents en route to the basket, though, finishing through contact and drawing plenty of fouls in the process. Smart is also extremely effective on defense, playing with a real chip on his shoulder here and being very effective with his combination of length and aggressiveness. A good, but not elite athlete, it will be very interesting to see how the different parts of Smart's game translate to the college level. He's a surprisingly complete player for his age, and is known as a great leader and a winner on every stage he's played at. While he's unlikely to become a full-time point guard, it may not be a surprise to see him take on more of a combo guard role in college, as he clearly has the basketball IQ and unselfishness to do so, which would likely improve his NBA prospects considerably.